In the search for abundant clean energy, scientists around the globe look to fusion power, where isotopes of hydrogen combine to form a larger particle, helium, and release large amounts of energy in the process. For fusion power plants to be effective, however, scientists must find a way to trigger the low-to-high confinement transition, or "L-H transition" for short. After a L-H transition, the plasma temperature and density increase, producing more power. Zonal flows occur anywhere there is turbulence, such as inside a fusion device or in a planet's atmosphere. "The most famous zonal flows in nature may be the well-known Jovian belts and zones, which make Jupiter look like a colorful, multilayered cake," said Ahdi Liu, an author on the paper. In fusion plasmas, zonal flows are crucial for regulating turbulence and particle transport within the reactor. 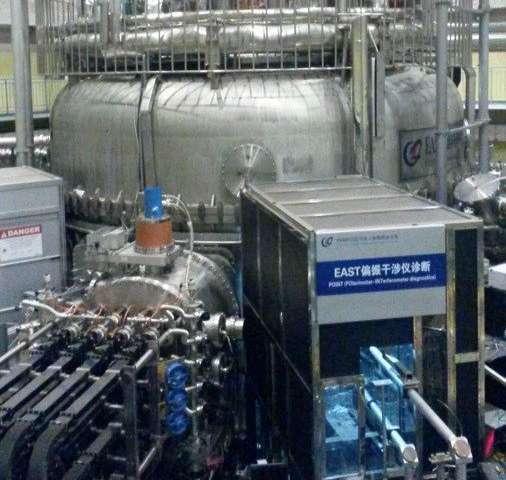 "With the gradual improvement of diagnostic technology, zonal flows in fusion plasma has become a research hot spot in the past two decades," Liu said. Previously, researchers at ASDEX-U, the fusion research device at the Max Plank Institute of Plasma Physics, used a similar system to detect GAM, but they measured the plasma at a single location, which makes the setup prone to interference. "This disadvantage is the main motivation for using two sets of Doppler reflectometers," Liu said. "We could 'purify' the GAM information by comparing the two location's measurements." The measurements taken at the two points did not entirely agree, showing that each reflectometer also picked up information from nonzonal flows. "It is completely necessary to extract accurate zonal flows information from multipoint measurement," Liu said. Using both measurements, they could clearly show that GAM interacted with the ambient turbulence. Going forward, the researchers will further investigate the role of zonal flows in turbulence and turbulent transport within EAST. I get it! It's just funding. We know there is no energy from fusion. Within plasma? LOL! "Scientists Just Jacked Up Plasma Energy Output"